Note: This post was originally written in January 2014, Keri has since updated it to incorporate the best tools as of today. Despite “experts” ringing its death knell, SEO and link building is still alive and kicking, and an important tool to have in your arsenal. Search engines should never be the primary target audience for your content, but it’s still vitally important to include them in your strategy if you want your content to be discovered and read by the right people. Like it or not, search engines are how people find content on the web, and it pays to have the data on exactly which keywords your target audience is searching for. Google’s Keyword Planner tool has long been a go-to tool for keyword research, and it can be a good place to start, but it’s not the be-all and end-all of keyword research tools. In fact, the Keyword Planner can be downright misleading if you’re using it as a tool to create content: it was created for advertisers, not content creators, and often deliberately won’t share the keywords you’re looking for. Looking to expand your keyword tool arsenal beyond Google Keyword Planner? Here are some of our favorites. Ahrefs Keywords Explorer can get you on the right track whenever you run out of unique ideas. It’s based on a database which contains 5.6 billion keywords across more than 200 countries. With such a database, you’ll discover keywords that your competitors have totally missed. Clicks Per Search – shows how many pages on average users click on when scrolling through SERP. Sometimes, they don’t go further than the top result, which means you’ll drive zero traffic if you rank second. Return Rate – estimates how many times a user searches for the same keyword per month. Some queries get one-time searches, while others spark long-term interest due to frequent updates, e.g. new episodes of TV shows. With Ahrefs Site Explorer, you can also track what keywords work for your competitors and compare them with yours to see the gap. Whenever they go up or down in organic search, you’ll get email alerts. It’s also a fantastic tool for competitor research. You can see exactly which websites are ranking for your target keywords, and which other keywords they’re targeting, whether organic or paid. The keyword difficulty scores are also an incredibly useful metric that not many other tools provide. And while the free option is undeniably useful, the pro version goes way further. With the Pro version, you get 10,000 results per report, up to 3,000 reports per day, plus you can track up to 500 keywords and 5 separate campaigns. Starting at $69.95 monthly, it’s a great tool if keyword research is a main feature of your day-to-day work. LongTailPro is an advanced keyword research software application that’s packed full of features. Its focus is on generating thousands of low competition long tail keywords based on a single root keyword, or multiple root keywords. The software is available for Windows and Mac, and you can install it on up to 3 computers. LongTailPro allows you to search multiple keywords at a time and generate up to 800 results, and you can pre-filter the results to get just the keywords you’re looking for. It also includes competitor analysis, and site ranking results from Google, Yahoo, and Bing. All these features are included in the free 10-day trial, so you can try it out before you purchase. Upgrade to the “platinum” version, and you also get a keyword competition estimate, and the ability to save favorite keywords and import lists of up to 10,000 keywords. Update: LongTailPro is now only available as a monthly or yearly payment option. While Google Keyword Planner can be a valuable tool for advertisers, it’s not an ideal tool for coming up with keyword ideas for creating content. It deliberately skews the results towards advertisers, so many keywords you might find valuable are simply left out of the results. You can see this on your own with a simple test: try to search for a keyword on Google’s Keyword Planner, and then plug the same keyword in Google itself. You’ll see many unique keyword suggestions via autocomplete as you type in your query, or listed as related searches at the bottom of the page, that will never show up in the Keyword Planner. That’s why KeywordTool.io is such a valuable tool. It gleans those autocomplete and related search suggestions to give you hundreds of unique keyword ideas that you’ll never discover with Keyword Planner. To dig further into your results and choose the best keywords, you’ll want the pro version, which includes search volume, CPC, and estimated competition for each keyword. With the pro version, you can sort and rank the keyword results, and export all your data into a CSV file. This quick and simple keyword tool was developed by Joost de Valk, owner and creator of Yoast.com and the famous Yoast SEO WordPress plugin. Like KeywordTool.io, it uses Google’s suggest function to come up with a list of suggested long tail keywords for any word or phrase you enter. 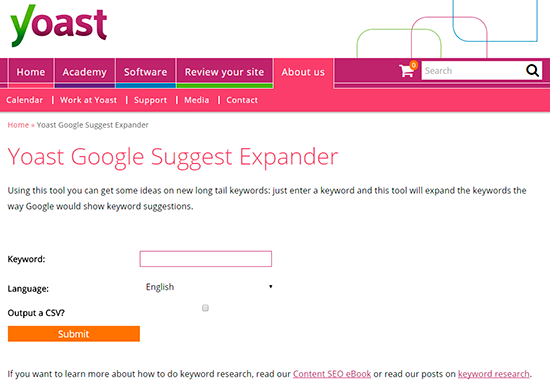 Yoast Suggests is a handy tool for generating lots of long tail keyword ideas. Though it doesn’t give you search volume or other details, it’s quicker and easier to use than Google Keyword Planner if you just need ideas to start with, and you can use one of the other tools on the list to do more in-depth research if needed. MarketMuse is a unique keyword research tool that works by auditing your website and using advanced topic modeling algorithms to find gaps in your content to come up with keyword suggestions. It ranks the results automatically by importance, allowing you to quickly prioritize which keywords to target. It also has a Content Grader tool that analyzes your existing content and suggests improvements to boost its quality. Unlike many other tools on this list, MarketMuse doesn’t just regurgitate data from Google, but has its own crawlers and algorithms to analyze content and provide the best keyword suggestions. 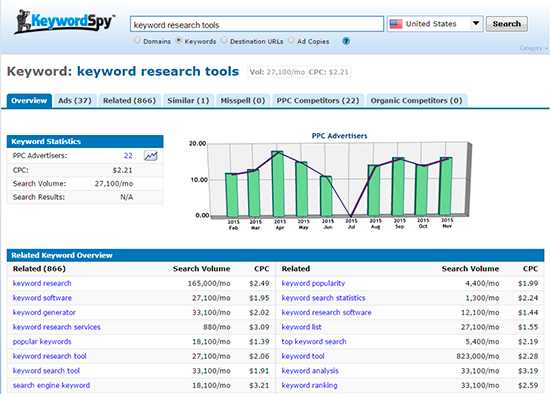 KeywordSpy is an advanced keyword research tool that allows you to track keywords and competitors over time. By entering your site, you get information on keywords to target and how you compare to your top competitors in the rankings, both organic and paid. Their database is updated daily, giving you fresh insights on how your rankings improve over time. One of their best features is the advanced search functionality, which lets you search and filter keywords by domain, destination URL, or even ad copy content. Without the data you need at your fingertips, your SEO efforts are wasted. 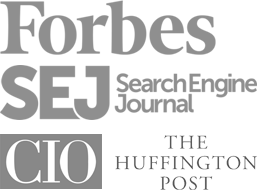 What tools do you use for generating keyword ideas and determining their value? Share your strategies in the comments.